Please enjoy the "encounter" that only experience in this hotel. 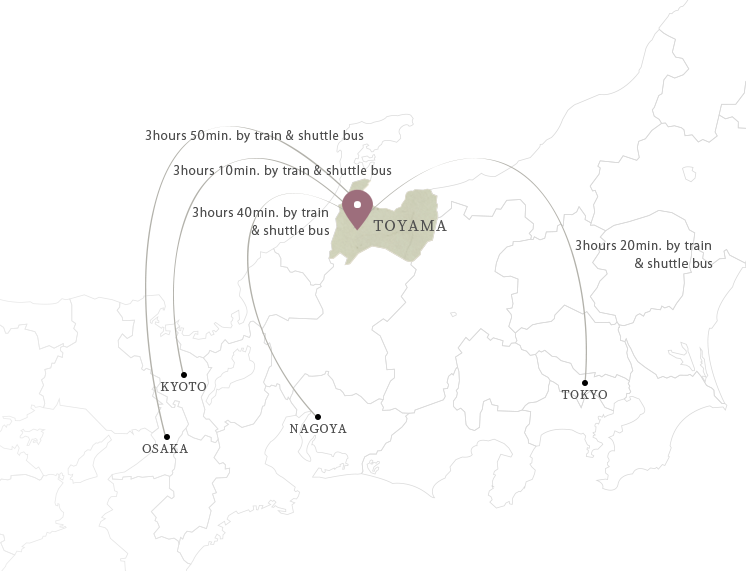 We founded as restaurant-inn in 1924,located in Shogawa Onsengo,Tonami-city,Toyama. Japanese culture is fading away because of import the western-style culture. 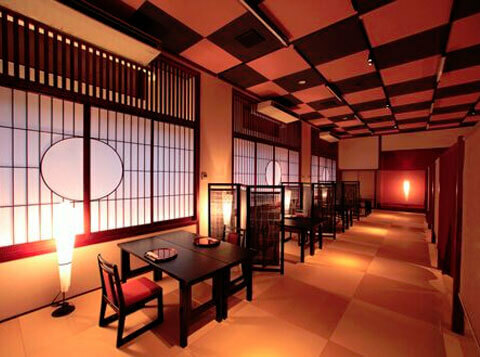 In this present situation,Japanese culture is still packed in ryokan(Japanese-style hotel). 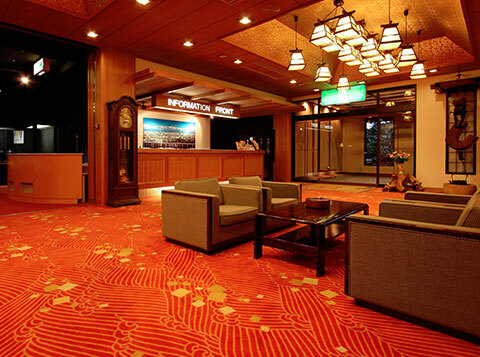 It is said that ryokan express the Japanese culture, and it is the revered around the world as Japanese brand. So we are proud of work in Ryokan. Please enjoy a pleasant time in Sanrakuen. 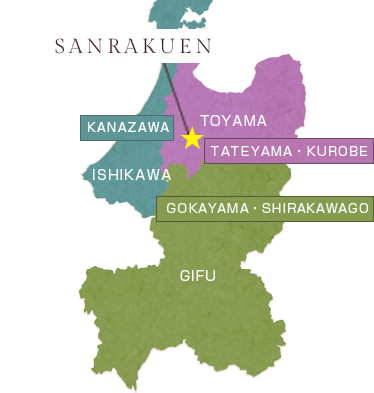 We offer Sanrakuen's tresure“hot spring”, “crusine" with cordiality, and “encounter” with us. Our hot spring is very unique in Japan. Because it contains abundant iron ion and carbon dioxide,rich salt content, and hydrogen carbonate ions. 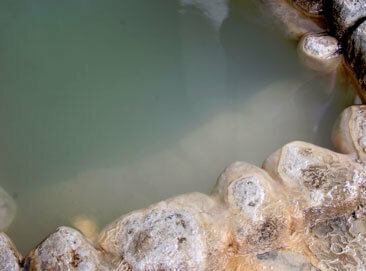 And it contains enough calcium and magnesium,this hot spring warms you up,and expect positive effects to heal diseases. This hot spring is famous as Torigoe-no-yu from a long time ago. 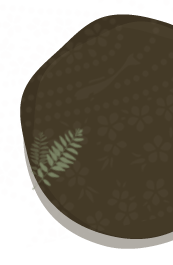 Many guest come in purpose of this hot spring. It includes iron and carbon-rich gas. We use this good hot spring when we produce bio-fango(hot spring mud). snow view, and stadium of stars at night. 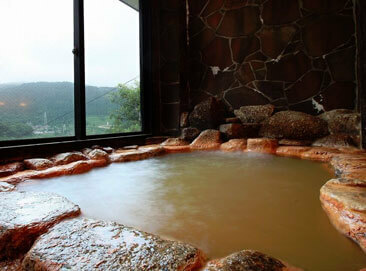 You can enjoy two cloudy hot spring, that have different element. The one is cloudy white:hydrogen carbonate bath. Your skin become soft and smooth. The other is reddish-brown : ferruginous bath. It has rich iron,so it is said to effect gynecology and dermatology diseases. Both of hot spring are popular among ladies. “Sanrakuen-Kaiseki” is a kaiseki meal that added the theme as“beauty and Health”. It's fun to look at, good to eat, and your body and mind will be pleased enough. This is a new suggestion from Sanrakuen. 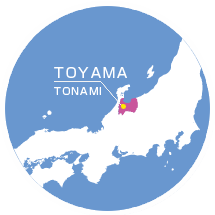 Toyama is famous for “Kito-kito” sashimi. (Kito-kito stands for very fresh in Toyama accent.) 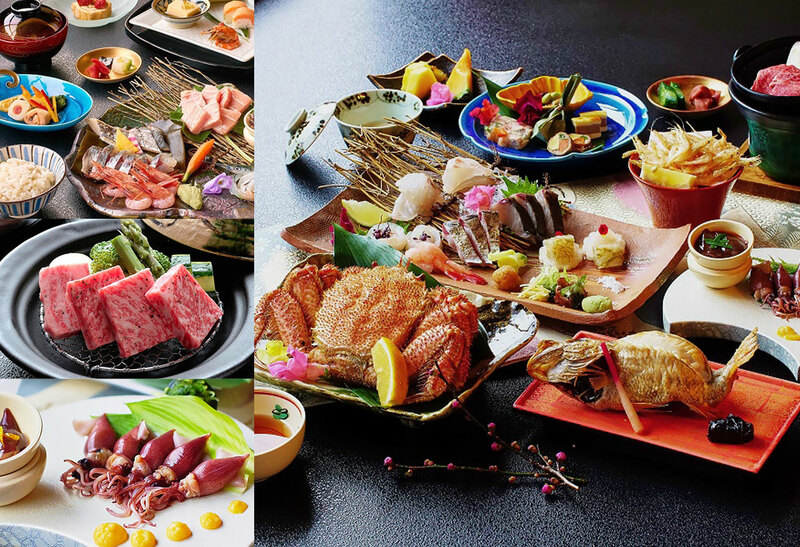 You enjoy seasonal food in Toyama in this course dinner, and we serve a assorted Sashimi and one pot dish with special Japanese beef as main dish. Please savor taste of Japanese course dinner which be made by our executive chef. 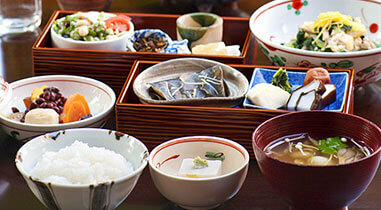 Please appreciate the delicacy of breakfast, using fresh seasonal food in Toyama. This room has a spacious open air bath, and a great view of the flow of shogawa-river and Tonami-Arashiyama from a big window. This room&apos;s open air bath size is more than 2 meters, and there is a terrace that can feel balmy wind. It has a great view of the flow of shogawa-river and Tonami-Arashiyama from a big window. You feel freshening wind from abundant water and river. You spend the relax time in lively greenery. Brightness in these room are designed to the same with fullmoon, because it is said in old days that people can sleep deeply in fullmoon illuminance at night. All rooms are faced toward shogawa Canyon, and you can enjoy the seasonal view,for example,cherry blossom in spring,fresh greenery in summer,beautiful colored leaves in autumn, snow view in winter. Guest room as time passes with hot spring has Japanese nostalgic memories. Escape from noises, this room offer you home-like,serene and comfortable feeling. You can feel the beauty of Japanese room atmosphere again. Rooms are decorated in rhythm with the four seasons. All room has seasonal view. This is an authentic beauty treatment salon by esthetician has CIDESCO(the world standard for beauty and spa therapy) qualification. All menu treated by hand, we provide facial and body treatment of course, and special beauty treatment for bride before wedding. Lobby is in relaxed atomosphere. You can use anytime,taking a little break before check-In, or during stay. Dinner time starts from 18:00 or 19:30. We&apos;d like to ask which time is good for you at check-In, but seats reserved on first come first-served basis,so we cannot meet your request in case the seats are taken. You can buy the regional sweets, goodies as memories of trip. Upon cancellation of reservation, the Customer will be charged a certain percentage of the tatal price of accommodation (cancellation charge) as listed below. Fango is hot spring therapy using hot spring mud. It's common enough to covered by public insurance in Italy. We introduce full-scale fango to Japan for the first time,therefore we form an alliance with Italy,and learn the production method of hot spring mud and treatment method. In addition, Sanrakuen conduct various experiment abroad and at home, in order to improve the “Shogawa biofango” quality and prove its effect and availability. Our effort get certified as public regional resource utilization business.  All treatment we serve for customers fill with esthetician's hospitality. Sensitivity to details. 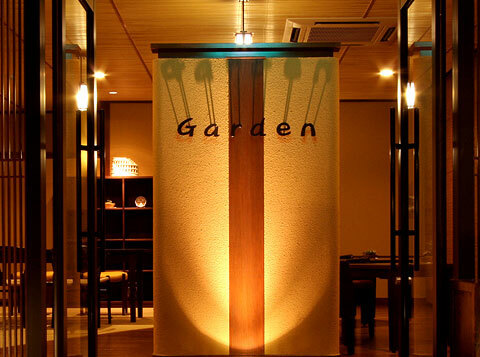 We pass on ryokan's hospitality from old age to esthetic treatment salon. We have the privilege of welcoming customers in our salon with high quality hospitality.  Our original oil massage sticked to technique by hand, A relaxed massage along with the flow of blood and lymph, comfortable stimulations manipulated acupressure points and muscle, and magical technique regain your youth. Boosting “natural healing power” that human have basically, You can meet you restored mental and body balance with a refresh feeling. 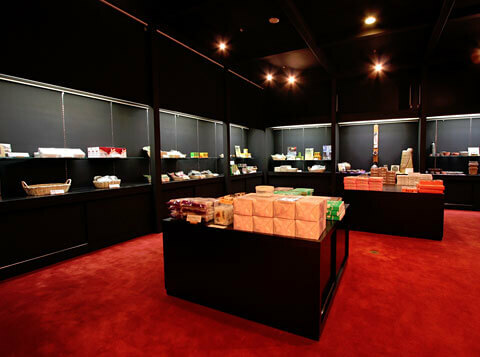 This is our esthetic that maximized the effectiveness of aroma and botanical effect. We always use the best cosmetics during treatment. Estheticians fully examine the components and effect of cosmetics. We choice the chemical agent-free cosmetics(synthetic surfactant-free,antiseptic-free, artificial colors-free),so you feel safe to our treatment. All course is treated by esthetician hand. Treatment by hand is soft and gentle,so it gains much popularity. Do you want to experience the treatment by our esthetician? 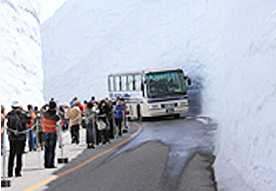 If you step out of Sanrakuen,your trip will be more and more interesting. You have the best experience by boading a cruise ship, taking a scenery,surprised at history, enjoying art. Around Sanrakuen not only beautiful scenery of sea and mountain but delicious foods. This visitor information helps your trip planning. 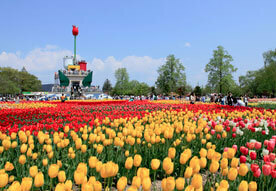 You can see tulip through a whole year, and get the knowledge of tulip history and culture. 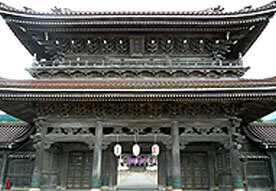 This is an old temple based of Jodo-shinshu (a kind of Buddhism) in the Middle Age.It is famous for its Inami carvings. There is a hall of Treasures stored national important cultural properties. This street is stone pavement in gentle upward slope. You feel the setteled with this old-town street. 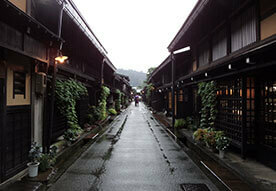 You can hear the sound of wood hammer from far and wide because of there are many carving studio along this street. 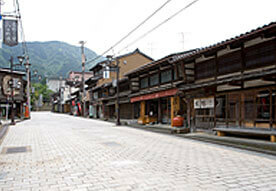 Merchant&apos;s house and castle town since edo era remain in central town of Takayama city. The scenery is similar to Kyoto. You can enjoy walking and eating sushi of Hida beef and Kushiyaki in Miyakawa morning market and old township(Furui-machi-nami). 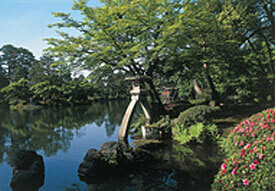 Kenroku-en is the one of three great gardens in Japan. 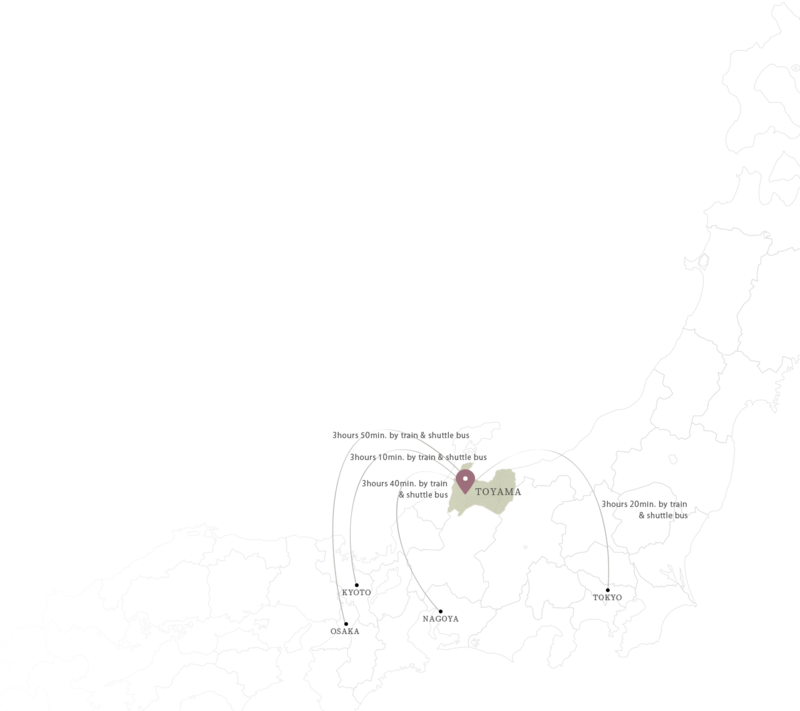 (Others are Kairaku-en(Mito,Ibaraki) and Koraku-en (Okayama,Okayama).) This is Kanazawa's main sightseeing spot. It has a lot to offer to tourist,for example,cherry blossom in spring,deep green of trees in summer,beautiful colored leaves in autumn, Yukitsuri (pine trees protected by ropes)in winter. Gokayama area is surrounded by mountain. 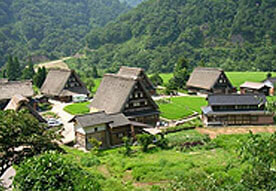 Traditional Houses in the Gassho Style remains in Villages as represented by Ainokura and Suganuma. They were included to the UNESCO list of World Heritage. Many people visit this nostalgic district in pursuit of peace of mind. This is the world's great mountain route that you can visit casually by using 6 transport (cable car, ropeway gondola, trolley bus,etc). You can take a walk, go on a trekking, and feel the breath of nature by botanical observation. Please contact us in advance by phone. © SANRAKUEN. All Rights Reserved.